Color is slowly easing back into the deciduous woods. 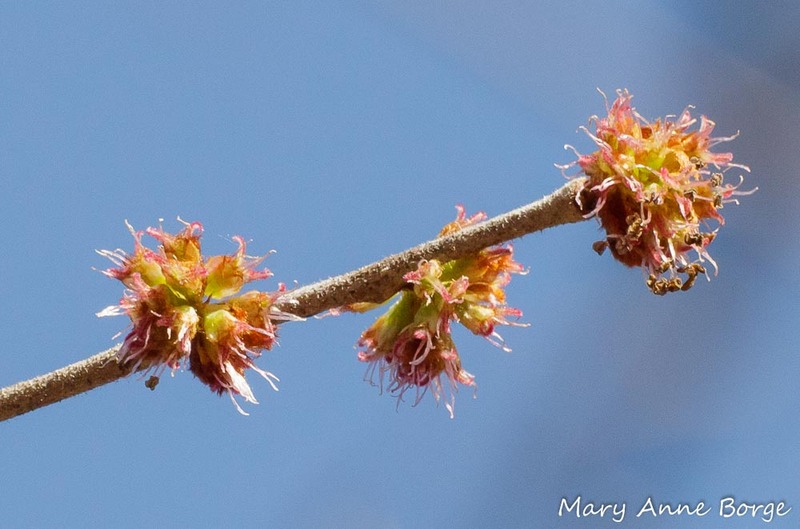 Branches that were bare all winter are beginning to show the subtle reds, greens and yellows of early blooming trees and shrubs. 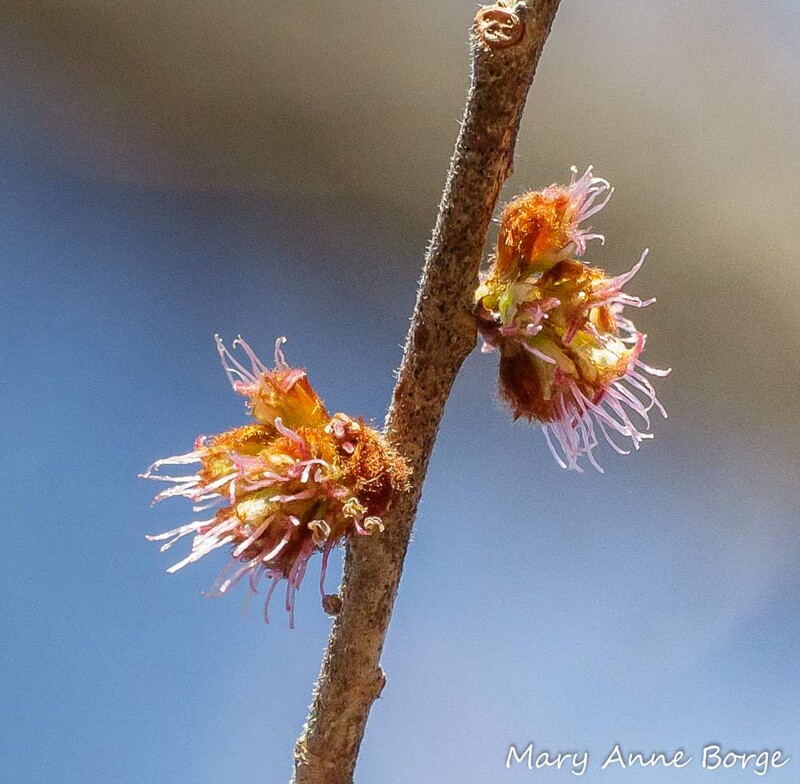 Slippery Elm (Ulmus rubra) is among the early flowering trees, often blooming sometime in March. 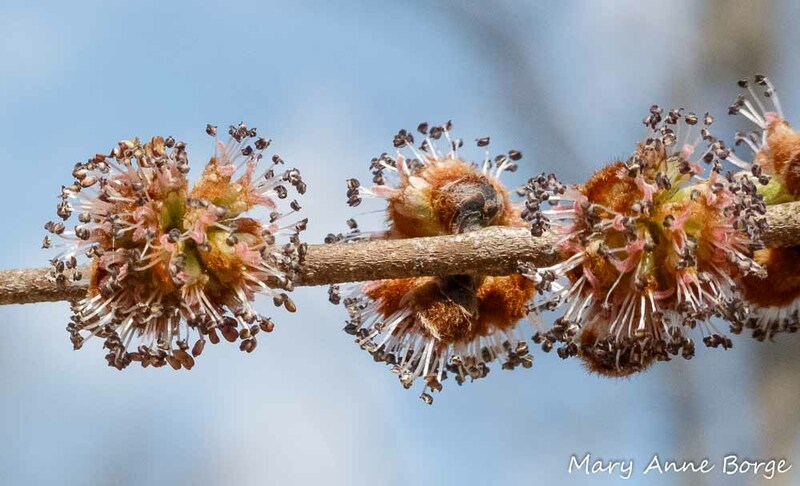 Before blooming, its rusty colored, fuzzy-hairy flower buds are visible throughout winter. Flowers that are successfully pollinated produce fruits that many birds eat, including Carolina Chickadees, Rose-breasted Grosbeaks, and Purple Finches. 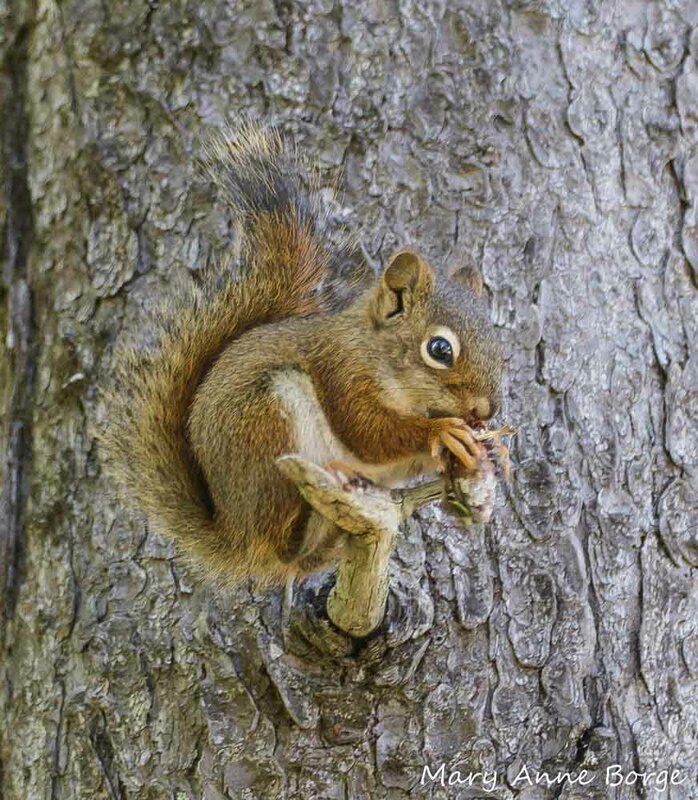 Squirrels and other small mammals also eat Slippery Elm seeds. Slippery Elm leaves are large and rough, with distinctly toothed edges. These leaves provide food for many insects that in turn provide pollination services for other plants, or food for other animals. 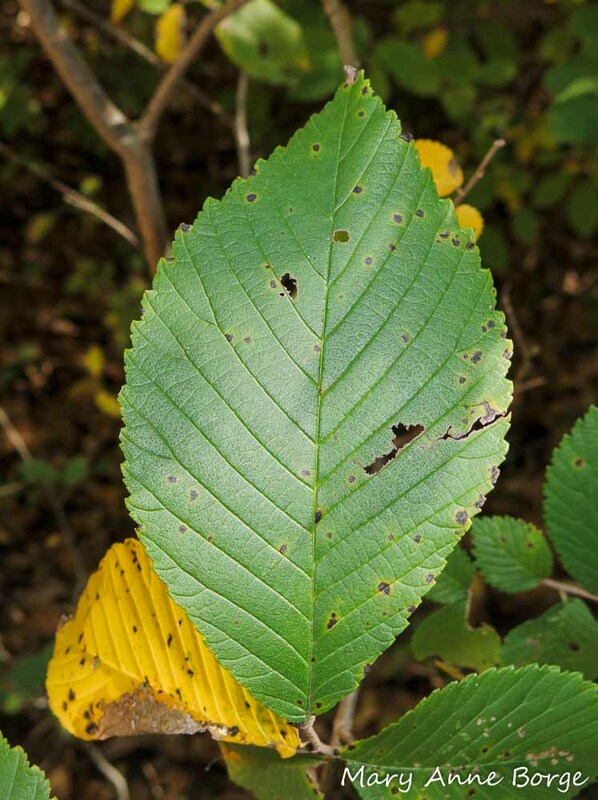 Over 200 species of butterfly and moth caterpillars (Leipidoptera), including those of Mourning Cloak, Question Mark and Eastern Comma butterflies and Polyphemous moths may eat the leaves of Slippery Elm and its close relatives. 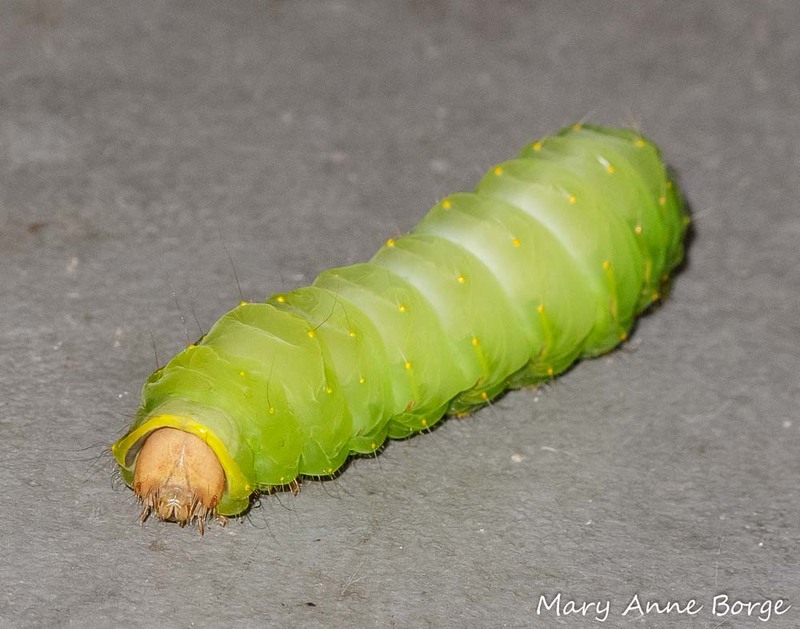 Polyphemus Moth caterpillar, looking for a place to pupate. What a plump, juicy treat for a hungry bird! 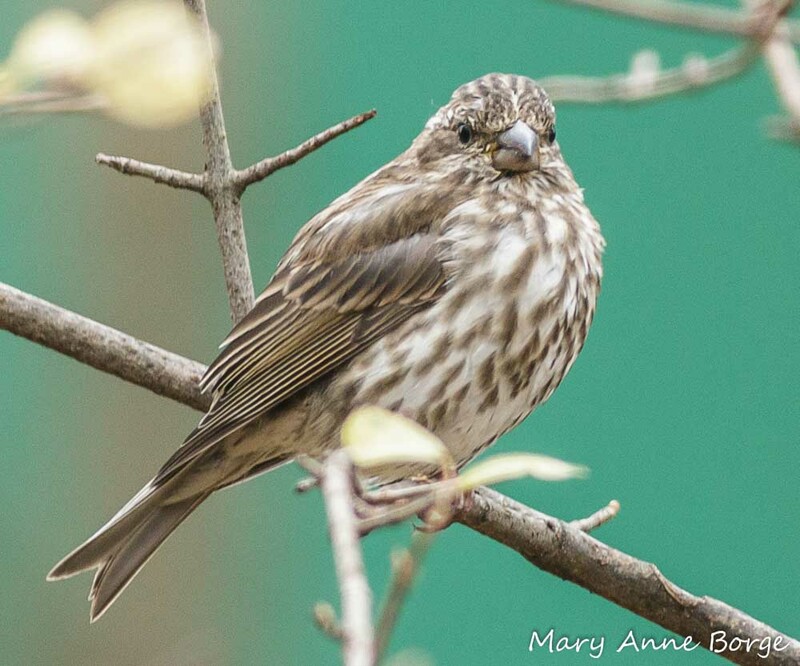 Birds depend on these insects as protein for themselves and their growing offspring. 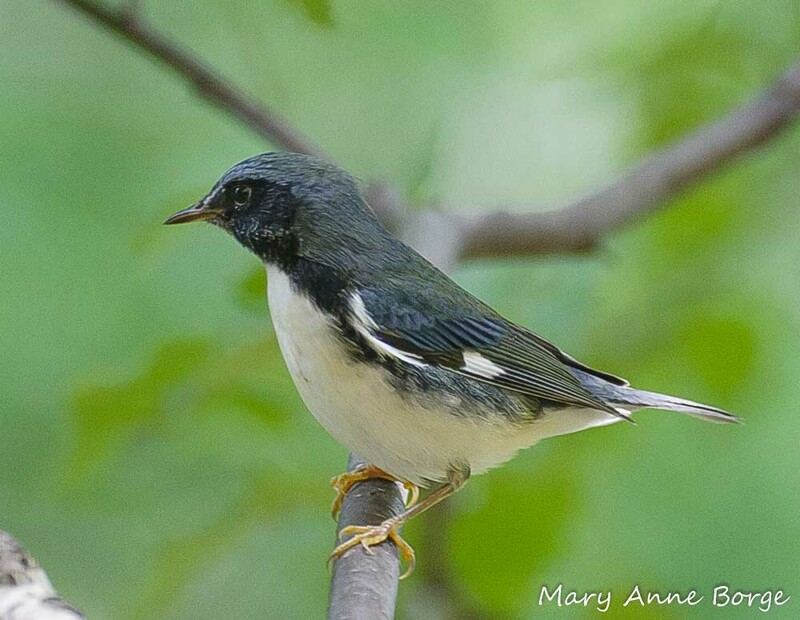 Male Black-throated Blue Warbler. Warblers, Chickadees, Titmice and most other birds depend on insects for a large percentage of their diet. 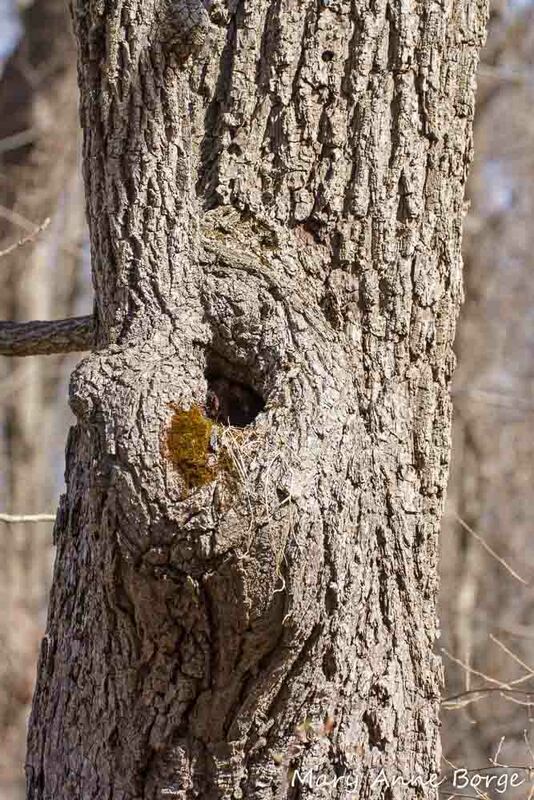 Cavity nesting birds or small mammals may find a suitable home site in Slippery Elm, while other birds, like Baltimore Orioles, may build their nests in its branches. Natural cavity in a Slippery Elm. Some strings of nest material are draped below the opening. Slippery Elm gets its name from its inner bark (the phloem) which is part of the vascular system that transports food throughout the tree. Slippery Elm’s inner bark is mucilaginous (thick, sticky) and fibrous. Indigenous North American peoples used the inner bark fibers to make rope or other cordage. Slippery Elm’s inner bark has also been used to make a tea that is easy to digest and high in nutrients; it was given to people who had difficulty consuming food. The inner bark was also dried and ground to make a flour high in nutritional value. Slippery Elm has many medicinal uses. As a demulcent it is well suited for treatment of inflamed mucous membranes throughout the digestive tract. It also has anti-inflammatory and astringent properties, and has been used externally to treat skin problems including wounds, ulcers and boils. Slippery Elm is available as an over the counter supplement, and has been approved by the Food and Drug Administration for use in throat lozenges. Even plant-derived supplements can have unwanted side effects, so careful research or consultation with a physician should take place before consuming Slippery Elm. Slippery Elm can be found in much of the eastern two-thirds of the United States and Canada, often in moist woods, stream banks, and woodland edges. Look for it blooming now in a natural area near you. Eastman, John. The Book of Forest and Thicket. 1992. Foster, Steven; Duke, James A. A Field Guide to Medicinal Plants and Herbs of Eastern and Central North America. 2000. Hoffmann, David. Medical Herbalism. 2003. 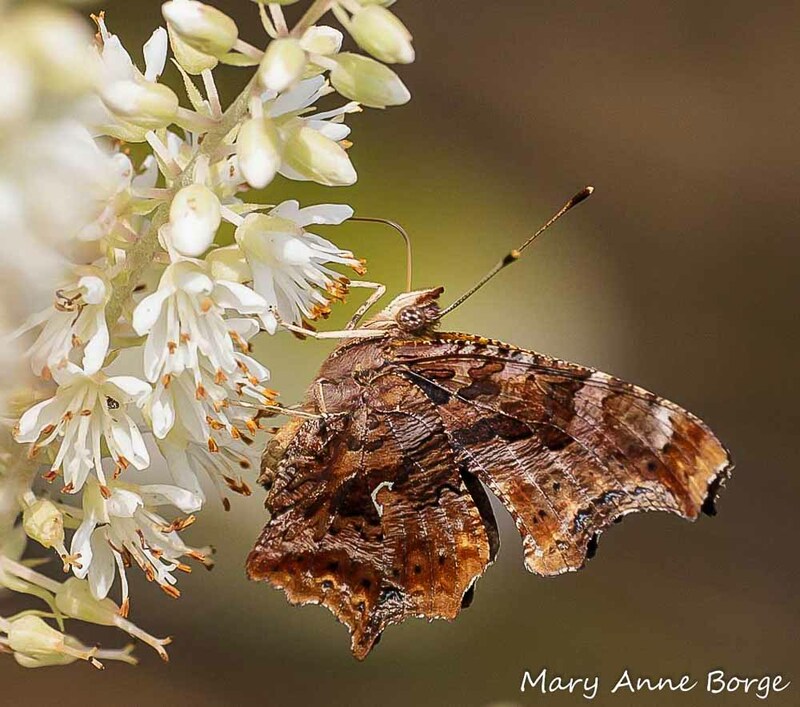 This entry was posted in Birds, Butterflies, Medicinal Plants, Native Plants, Nature, Uncategorized and tagged Black-throated Blue Warbler, Eastern Comma, Polyphemous Moth, Slippery Elm, Ulmus rubra by Mary Anne Borge. Bookmark the permalink. A very valuable (to other wildlife) and underappreciated tree. Might see if I can tuck one of these into my yard somewhere. Just love that it hosts so many insects. Thanks, Patricia! You’re too kind. Sometimes. If you are interested, please feel free to contact me at info@the-natural-web.org.